මම අලුතෙන් වෙබ්කැම් එකක් ගත්තු නිසා ඒකෙන් කරන්න පුළුවන් වැඩ මොනවද කියලා හොය හොය ඉන්න අතරේ තමයි මේක හොයාගන්න ලැබුණේ. මේ මෘදුකාංගයේ නම LemonScreen – තවමත් අත්හදා බැලීමේ මට්ටමකයි තියෙන්නෙ. ඒත් නියම වැඩසටහනක් නිසා පාවිච්චි කරලා බලන්න හිතුණා. සරලවම කියනවා නම් මේක මගින් කරන්නේ ඔබේ මුහුණ හඳුනාගැනීම තමයි. එතකොට ඔබේ මුහුණ මගින් පරිගණකය අන්ලොක් කරන්න ඔබට හැකියාව ලැබෙනවා. තවමත් වින්ඩෝස් වලට ලොග් වෙනකොට ඒක පාවිච්චි කරන්න තරම් දියුණු කරලා නැහැ. ඒත් පාවිච්චි කරන අතුරතුර පරිගණකය ලොක් කරන්න අවශ්‍ය වුණොත් මේක පාවිච්චි කරලා පරිගණකය ලොක් කරන්න පුළුවන්. ලොකුම දේ තමයි මෙය නොමිලේ ලබාදෙන්නක් වීම. භාවිතය ගොඩක් පහසුයි. මුලින්ම ඔබට වෙබ් කැමරාවක් ඕන. ඉන්පස්සේ මේ LemonScreen මෘදුකාංගය ඩවුන්ලෝඩ් කරගෙන (මෙගාබයිට් 2ක පමණ මෘදුකාංගයක්) ස්ථාපනය කරන්නයි තියෙන්නෙ. ස්ථාපනය කරලා ධාවනය කිරීමෙන් පස්සේ ඒ මගින් ස්වයංක්‍රීයව කැමරාව ක්‍රියාත්මක කරාවි. ඉන්පස්සේ ඔබට තියෙන්නෙ ඔබේ වින්ඩෝස් මුරපදය (password) ඇතුළත් කරලා Update Model බොත්තම ක්ලික් කරන එක පමණයි. මේ කටයුතු වලින් පස්සේ Alt+L යතුරු භාවිතයෙන් පරිගණකය ලොක් කරන්න පුළුවන්. නැතිනම් වැඩසටහනේ සඳහන් කර ඇති කාලයෙන් පස්සේ ස්වයංක්‍රීයවම ලොක් කරන්නත් පුළුවන්. පරිගණකය නැවතත් අන්ලොක් කරන්නට නම් තියෙන්නෙ කැමරාවට ඔබේ මුහුණ පෙන්වන එක පමණයි. මේ මෘදුකාංගයෙන් මුහුණේ පින්තූරයක් රඳවාගන්නේ නැහැ. රඳවාගන්නේ ඔබේ මුහුණේ මොඩලයක් (Binary ආකාරයෙන්) පමණයි. Update: අමතක වුණා, බැරිවෙලාවත් මුහුණ හඳුනගත්තේ නැතිනම් වින්ඩෝස් වල ඔබේ මුරපදය ටයිප් කරලා අන්ලොක් කරන්න පුළුවන්. Well I bought a new webcam, just for fun, and I was searching ways of putting it to good use. That’s when I found this gem. It’s a program called LemonScreen – still in development but it has a great goal – and something most of you will love. 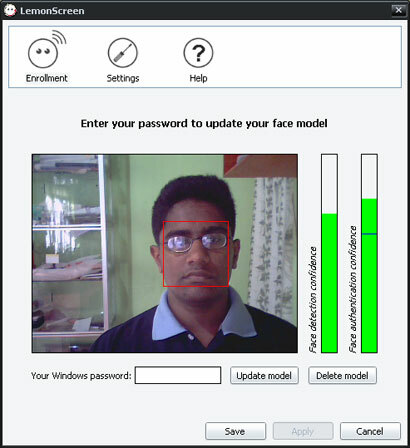 Simply put, this program is capable of face recognition. You can use it to lock and unlock your computer. It doesn’t work with windows logon, yet. But you can lock your computer while working. LemonScreen is free, works on Windows. Usage is really simple. First of all you’ll need a webcam. Then you’ll have to download the Lemonscreen software (around 2MB) and install it. After installation, you can change the settings. When you open it, it’ll activate the camera automatically. Then you must enter the password and click on Update Model. That’s all. You can lock the PC anytime with Alt+L or it’ll lock the PC after the predefined time. To unlock the PC, all you have to do is show your face to the cam. 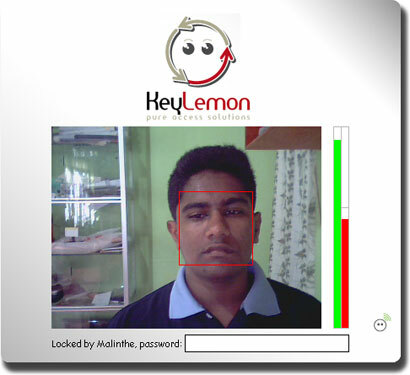 LemonScreen doesn’t keep an image of your face in the PC, instead it keeps a model of your face in binary format. Update: Almost Forgot, if it doesn’t recognize you face you can unlock the PC by just typing your windows password. කාගෙන්වත් ගුටි කාලා ඉන්න එපා. අන්තිමට machine එකත් unlock කරන්න බැරුව යයි . ඒක මරු. දාල බලන්න ඔනෙ. වැරදිලාවත් ඕක හරියට වැඩකලෙ නැත්තන් unlock කරන විදියක් තියෙනවද? මේක අනාගතයේදි වින්ඩෝස් ලොගින් එකටත් ආවොත් නියමයි. අම්මෝ අපි දන්නවා උබ මුන බ්ලොග් එකට දාන්නේ කොහොමද කියලා හිත හිත හිටියේ කියලා !!! මොකද ඉතින් ගැනුලමයිට ඔය මුන පෙන්නගන්න විදියක් නැතුවනේ හිටියේ… අනේ අපි ඔය වයස පාස් කලා ! මේ දාගෙන බැලුවා වැඩ කලේ නෑනේ. ඕනම කැමරාවක් සපොට්ද?